Today's gift is another smaller one--fleur de sel. 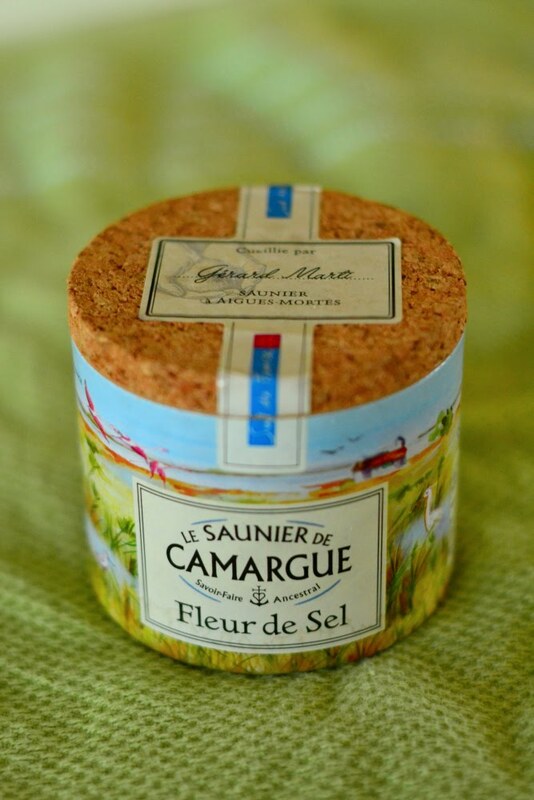 I especially like Le Saunier de Camargue that I bought in the local grocery store in France before I left. I still have some left, but I'm happy to see that I can order more on Amazon.com when I run out. This is great sprinkled on food after it's been cooked. The tiny crystals are amazingly flavorful, but retain a tiny bit of crunch. I just stumbled upon these Vanilla Bean Caramels with Fleur de Sel over at Annie's Eats, and they're next on my list to try with this versatile salt. This would make another great stocking stuffer for that foodie friend on your list! **This post has been written of my own accord because I like the product. I have had no contact with Le Saunier de Camargue, and they have offered me nothing in return for reviewing this product. I brought these little boxes of salt back from France with me also. They make wonderful gifts, but I did keep a few for myself also. As soon as there is a actual cool off within the atmosphere, it is period totart considering leg as well as leg higher prada saffiano tote bag, whichhould end up being put on more than your own duplicate totes. Select toned, practicaltyles with regard to caught throughout the day as well as engage inome restricted, heeled duplicate totes which will change your own gucci Sukey tote bags beautiful eveningwear. The free best within metallichades may be the ideal accompaniwoment for any large particular date as well as appears fantastic whenever teamed withuperkinny duplicate totes. With regard to amart appear throughout the hotter several weeks, lip upon a bit of ballethoes along with a gentle, batwing best for any floaty, however expert really feel. The well-tailored whitehirt additionally appears superb along with a bit of darkkinny chanel outlet could be completely accessorised having a slim cardigan for that workplace. To provide your own ensemble an expert as well as attention getting advantage, contain atronghoulder fake hermes handbags that will stability your own best fifty percent as well as hips completely as well as make sure you've got a company such as atmosphere. Trim orkinny match duplicate totes tend to be ideal especially when teamed having a traditional, installed whitehirt or perhaps a jacket best. Great duplicate totes tend to be an additional important as well as even though you believe your own times associated with leg levels tend to be previous, amall back heel andome stop bum pointy feet are simply the one thing to provide your own ensemble an advantage. The important thing in order to upgrading the actual rock and roll appear would be to blend grunge along with matured glamour. Believe washed out music group t-shirt coupled with an attractive precious metal necklace or perhaps a tough as well as difficult duplicate totes as well as hermes victoria bags combooftened with a pinklip as well as alash associated with red-colored lipstick.